The smelt, a 2 to 3-inch fish listed under both federal and state Endangered Species Acts, is found only in the Delta estuary. It is regarded as an indicator species, a fish that demonstrates the health of the entire Delta ecosystem. 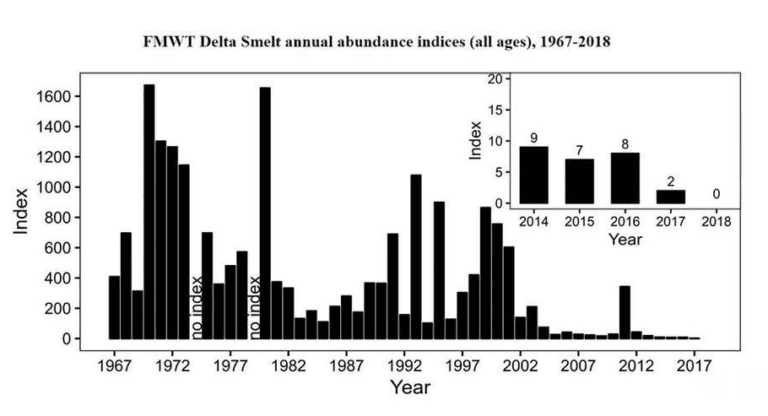 While decades of water exports and environmental degradation under previous governors and federal administrations have brought the smelt, once the most abundant fish in the Delta, to the edge of extinction, Governor Jerry Brown and his administration did nothing to reverse the trend, but only helped to worsen the endangered fish’s status, according to fishermen and environmentalists. Background from CDFW: The California Department of Fish and Wildlife has conducted the Fall Midwater Trawl Survey (FMWT) to index the fall abundance of pelagic fishes nearly annually since1967. FMWT equipment and methods have remained consistent since the survey’s inception, which allows the indices to be compared across time. These relative abundance indices are not intended to approximate population sizes. However, we expect that our indices reflect general patterns in population change.